You are here: Home / Arts & Culture / Burlesque is back in Valletta! Burlesque is back in Valletta! Strait Street, Valletta, evokes a certain past period in the life of our capital; one that comes with a whiff of sleaze, rowdy bars, off-limits activities and titillation. It is a past that is being recalled in a more gentrified way today with the opening of new bars and restaurants in the old music halls and dives. Many of these face-lifted venues make play of the heyday of Strait Street when Burlesque art forms were all the rage, and regular entertainment for off-duty servicemen. Old signage is lovingly retained and interiors echo 1950s’ style. Now though, Burlesque is back in Valletta for real with the 9th edition of what promises to be another sell-out show by the talented team of Dazzle Troupe. Its chosen and apt venue for next weekend’s shows (26-28 April) – the British Legion Bar (Melita Street) – recalls Valletta’s colonial past. The troupe comprises some of Malta most ‘insider-known’ writers and performers who are tackling this time a show based on the Blitz. The team says its acts ‘transform one of the most terrible periods of human history into an evening of rollicking fun…presenting World War II like [we’ve] never seen it before!’ It’s a show for ‘battle-weary (not to mention horny) soldiers, pulling out their customary smattering of bawdy music, eccentric comedy sketches and dance to ensure that they keep their rowdy crowd happy with a show that’s by turns raunchy… and raunchier’. 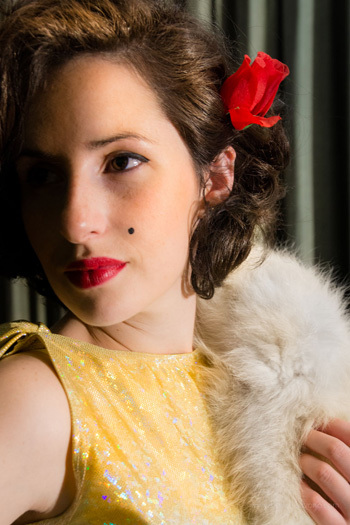 As this sounded intriguing, we asked one of the main protagonists of Dazzle Troupe, Nicole Cuschieri, to give us a few insights into why they revived Burlesque…and not just in its 1950s’ infamous form! “The troupe formed in 2008 with the idea to create a risque’ yet artistic variety show in which different types of performers collaborate and create funny, daring and absurd sketches. We do sometimes reference Valletta and its sleazy past, especially in this show which has a WW2 theme. After the first show which turned out to be so well received, we decided to keep going and they have flourished over the past four years and are as much fun as ever! “These shows are inspired from the first roots of Burlesque, during Music Hall and Vaudeville times.. We sometimes then delve into the 1950s’ Burlesque mainly in terms of costume and the occasional stripper! However, the formula of this show goes back to Victorian times, though these shows are not reenactments and have now evolved into something unique with a definite Maltese flavour. “The British Legion Bar is a perfect location for this show due to its past and history and its truly vintage atmosphere. The owner is a lovely man too and I think its my favorite location yet. “How we work? I come up with a theme and then approach the die-hard, regular members of the troupe and bounce ideas around with them to come up with a sketch. With each show I work a little differently to keep perfecting the working practice. Once the ideas are set, the artists go off and create their scripts/songs/choreography. Then we meet for rehearsals and develop the ideas. We have become very close over the years and the performers are always working with different members for each show to keep it from becoming stale. The cast has grown and grown; we started our first show with eight performers and now have 22 in the latest show! “The most challenging part of the show is presenting good quality sketches. As the work is all original, you are not relying of ready made well known scripts that you are confident about. So it makes the process a little scarier. However, the troupe members are all so talented that I believe in them 100% and so far, we’ve received an abundance of positive feedback from audiences. “About the upcoming show? Well, travel back in time once again and enjoy the Troupe’s ninth show: if it’s your first, you’ll finally discover what all the fuss is about and if you’re a returning customer, rest assured that this will be, we hope, our best show yet! Performers and writers include: Alex Vella Gregory, Alex Spiteri Gingell, Joseph Zammit, Marilu Vella, Vee Stivala, Marie Claire Camilleri, Marie Claire Pellegrini, Teodor Reljic, Pete Farrugia, Katherine Brown, Becky d’Ugo, Joe Depasquale, Whats their names theatre, Karly Cole, Matt Bonanno, David Chircop, Miriam Calleja, Tigerbilly Vella, Leona Gold and the amazing Brigit Gauchi Borda dancers! The shows start at 9pm sharp. The British Legion Bar, Melita Street, Valletta. Tickets are at €12. Doors open at any time, with food and drink served. For a bit more info on Strait Street’s past, see this post.